EDITOR’S NOTE, 12/15/17: Due to a technical glitch in the Global Forest Watch tool, the original tree cover loss data we published for Brazil, Democratic Republic of the Congo and Indonesia were incorrect. Tree cover loss was higher than originally reported in DRC and Indonesia, and lower in Brazil. We have updated the information below for accuracy, and we regret the errors. We have also removed a reference made in error to a concession in Indonesian Papua. Please contact PlacestoWatch@wri.org if you need additional clarification. Tropical forests, and the people and animals who call them home, are constantly threatened by development. Deforestation from activities such as road building or the expansion of an oil palm plantation often isn’t spotted until a sizable patch of land has been cleared. But satellites are watching. 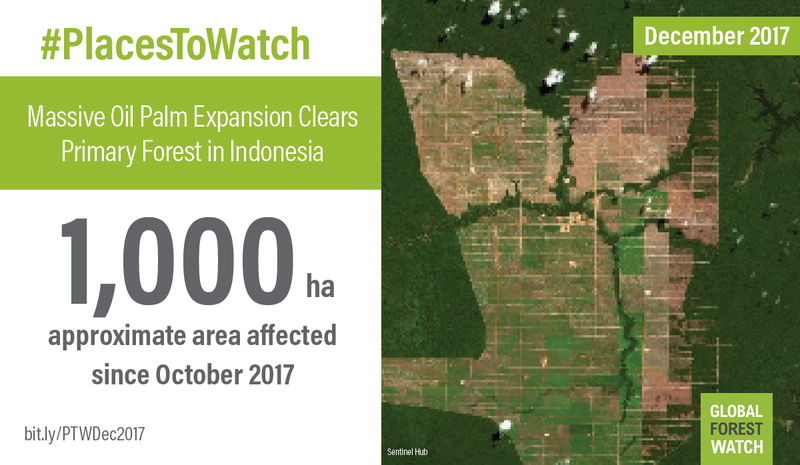 GLAD deforestation alerts on Global Forest Watch are updated weekly, spotting even small changes in forests around the globe. 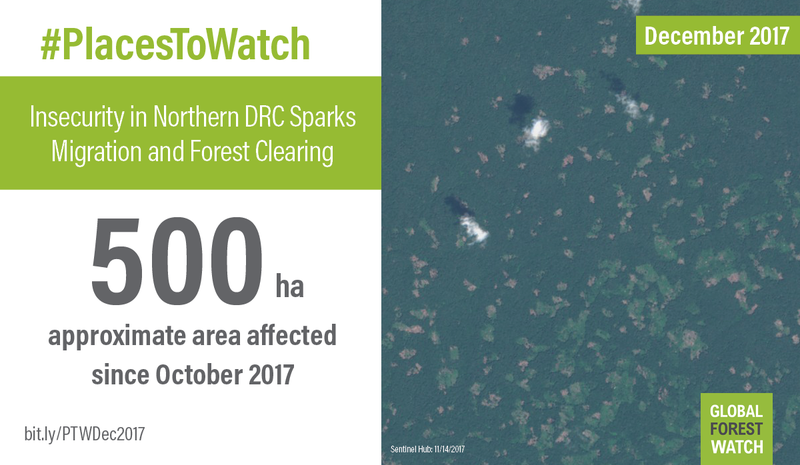 Our new “Places to Watch” initiative regularly identifies the most concerning areas of recent deforestation from thousands of alerts around the world, and pairs them with satellite imagery, credible descriptions of what is happening on the ground and resources to learn more. We hope to galvanize action to prevent further forest loss. This year has been particularly bad for forest fires in Brazil – fires spiked in September to the most ever recorded in a single month, and 2017 is now on track to break the record for the most fires in a single year. Though drought has increased the risk of fires, almost all are human-caused, likely to clear forest for agriculture. Forest degradation from logging exacerbates fires because forests that have been logged previously lose their natural fire resistance. These fires are posing serious threats to indigenous territories. Satellites have detected more than 24,000 hectares of tree cover loss, an area nearly double the size of San Francisco, since October in the Kayapó Indigenous Territory in the Brazilian Amazon. Indigenous lands in the Brazilian Amazon have historically been incredibly successful in slowing deforestation. Around 8,000 Kayapó live on more than 11 million hectares of legally protected land, one of the few remaining patches of undisturbed forests on the edge of the Amazon. The recent deforestation is likely due to fires in areas previously degraded by logging and other extractive activities. According to Barbara Zimmerman from the International Conservation Fund of Canada, “the pressure on Kayapó lands grows daily, and the Kayapó are totally on their own to face a tidal wave of illegal activity, especially logging and gold mining.” Invasions of illegal logging and mining continue in the eastern and northern corners of the territory. Despite these pressures, there is reason for hope: NGO support of the Kayapó seems to be working, as areas patrolled by the Kayapó and other groups have not been affected by illegal activity. The Xikrin do Rio Cateté Indigenous Territory, located just 25 kilometers away from the Kayapó territory, has also experienced significant tree cover loss from fires. 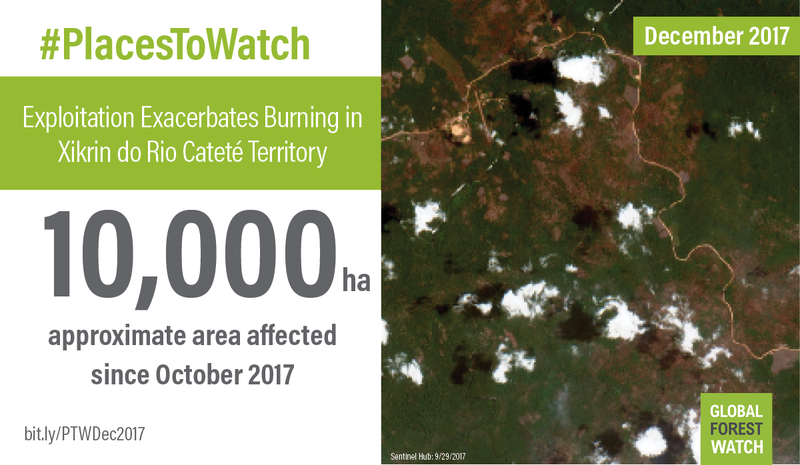 GFW indicates that more than 10,000 hectares, has burned in recent months, likely due to disturbance in previously degraded land. In the 1990s, a logging company exploited an agreement with the Xikrin and left the territory over-logged and severely degraded. More than 500 hectares of intact forest have been cut between two large cities in Democratic Republic of the Congo (DRC), Lolwa and Komanda. As the largest areas of unbroken wilderness in the world, intact forests are critical ecosystems for biodiversity and carbon storage. According to information collected by The Wildlife Conservation Society, forests in the region north of RN4, the main national road, have been cleared for charcoal and agricultural production (including cocoa). Small-scale miners are operating in areas south of the road. Rebel movements in Beni, a city approximately 150 kilometers south of the clearings, may be pressuring people to flee north on the RN4, causing increased disturbances within these forests. These forests are close to the Okapi Wildlife Reserve and are critical for both livelihoods and biodiversity. Expansion of an oil palm plantation in Indonesia’s Papua province caused 1,000 hectares of deforestation since October alone, bringing the total amount of deforestation in the plantation area to nearly 20,000 hectares since 2014. Although considered “planned” deforestation, the extent of this loss is concerning considering the potential loss of critical biodiversity and carbon stocks. Papua holds around a third of Indonesia’s remaining rainforest. Tree cover loss in the province has been steadily increasing over the last five years, more than tripling between 2011 and 2016. 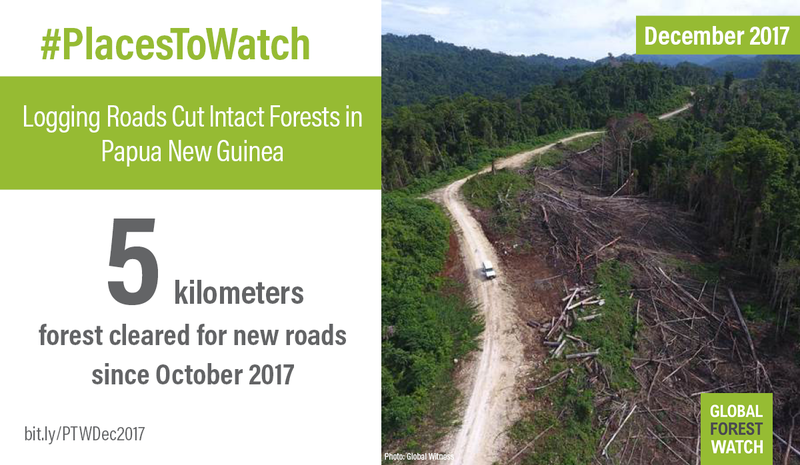 Around 5 kilometers of new logging roads cropped up in intact forests in the Papua New Guinean province of East New Britain since October. Global Witness visited the province in November, documenting the rapid expansion of logging. Papua New Guinea is an incredibly biodiverse country – despite covering only one percent of the world’s area, the country contains seven percent of its biodiversity. However, Papua New Guinea’s forests are increasingly under threat, with the rate of tree cover loss more than doubling in the past three years. Historically, subsistence agriculture and commercial logging have been the biggest drivers of forest change in Papua New Guinea. In 2016 alone, the province of East New Britain exported three-quarters of a million cubic meters of logs. More than half of this timber came from forest clearance operations opposed by local landowners, according to Global Witness. These aren’t just "Places to Watch;” they’re places to act. Government agencies, private companies and local people have the power to stop deforestation before it gets out of control; readers like you can help this process by drawing public attention to these areas. We encourage you to share these places, including on social media using #PlacesToWatch. 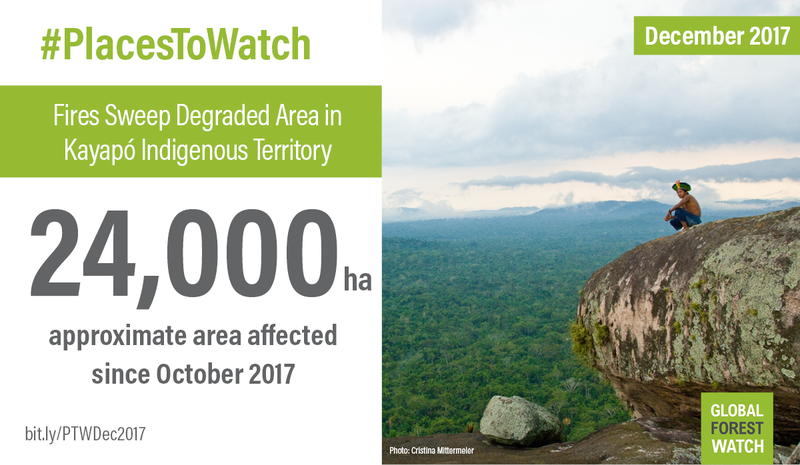 To stay abreast of more developments in the world’s forests, sign up to receive our Places to Watch notifications, and read our blog post for more information on how we spot and select these at-risk areas.